my girlfriend is such that we can talk art, music, politics, design, food, etc, etc. But the real joy comes when we converse about different topics. Such as, words that have a certain feel to them. sharp, crash, clap (i know what sayshuhs thinking). words that have a feel or edge or a bit of onomatopoeia. we can also bust rhymes at length. it's more like you shove an inferior swab in your ear and it bends and stabs with it's less than ample amount of cotton cushioning and you immediately wish you had invested that extra 40 cents in the real deal. lesser swabs just don't seem to pick up anything. 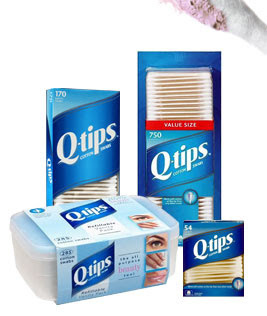 qtip brand you can get in there deep without fear of drum puncturing unless youre the careless type that leaves the tip in your ear whilst prepping and bump into something sideways ramming it deep inside. c'mon now you know you cringed at that one. don't be fooled people, open up your eyes...and lose the earjam. I agree that the QTip brand is better - not only for its quality swabs, but its also named after one of my favorite hip hop artists. Or is it vice versa? Anyhow - y'all shouldn't push that tip mich deeper than the outer ring though. wow - that didn't work. Well just google this:should you remove earwax?